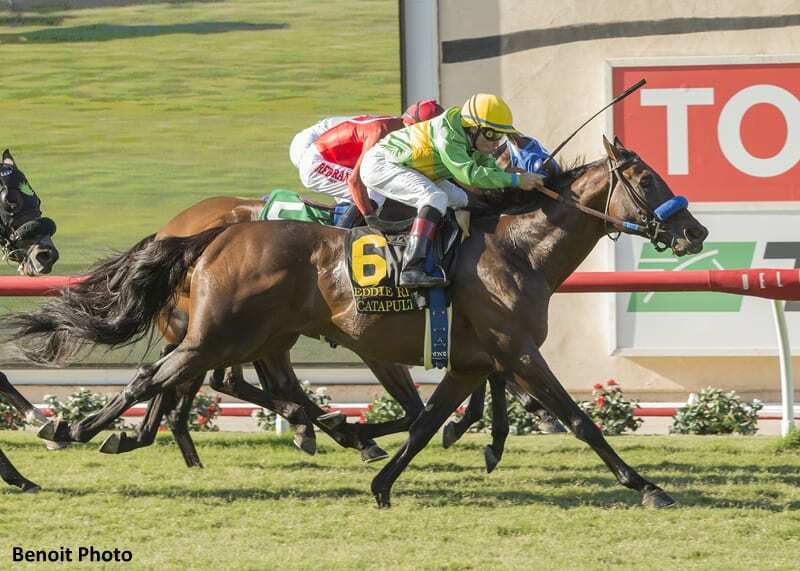 Woodford Racing's Catapult came flying down the center of Del Mar's turf course to win Sunday's Grade 2 Eddie Read Stakes, providing a 21-1 upset in the $250,000 contest. The 5-year-old son of Kitten's Joy came from off the pace to nail 3-1 favorite Sharp Samurai by a head on the wire, thanks to a perfectly-timed ride from jockey Drayden Van Dyke. Trained by John Sadler, Catapult completed nine furlongs over the firm turf in 1:46.07 to earn his first graded stakes victory. Sadler and Van Dyke also teamed up on Saturday to win the G2 San Diego Handicap with Catalina Cruiser. Prime Attraction sped out for the early lead, closely tracked by both Sharp Samurai and Multiplier through early fractions of :23.75 and :47.65. Catapult traveled in approximately seventh down the backstretch, and was still well back at the top of the stretch. As Sharp Samurai took command from a very game Prime Attraction in the lane, Van Dyke was getting no response from Catapult. He changed tactics, swung the colt outside to flip to his left lead, and suddenly had a lot of horse. Catapult got back on his right lead and went flying by all his rivals in the final sixteenth of a mile, just getting up in time to put his head in front at the wire. Sharp Samurai had to settle for second, and Prime Attraction finished a close-up third. Bowies Hero checked hard in the final 50 yards, but didn't appear to be poised to finish better than fourth. Bred in Kentucky by Breffni Farm out of a daughter of Storm Cat, Catapult was a $235,000 short yearling at the Keeneland January sale, and later brought $350,000 at Keeneland September. He has now won five of 14 starts for earnings of nearly $500,000. This entry was posted in NL List, Racing and tagged catapult, Del Mar, drayden van dyke, Eddie Read, eddie read stakes, john sadler, kitten's joy, sharp samurai, storm cat by Paulick Report Staff. Bookmark the permalink.